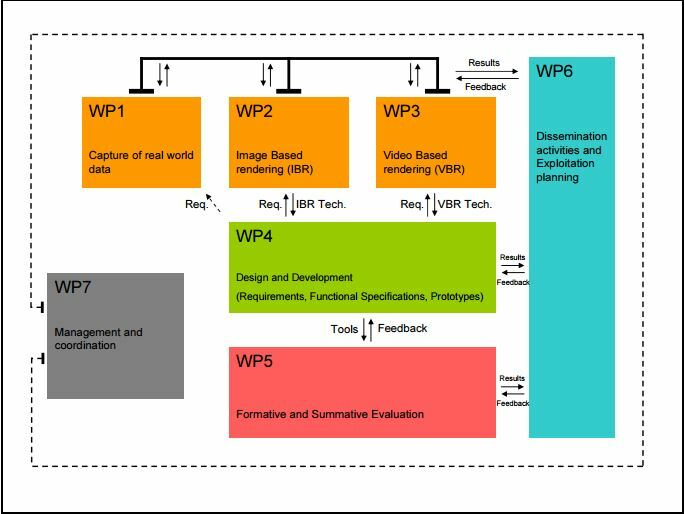 WP1 will develop Image- and Video-based capture methodologies and technologies. These systems will provide solutions for assisting the user during the acquisition of images/videos. WP2 will extend and develop the next generation of IBR algorithms which will allow the rendering of detailed representations of outdoor and indoor environments. General environments will be (semi-) automatically split into high-level objects, which can subsequently be manipulated within the mixed pipeline. WP3 will extend and develop new Video-Based Rendering (VBR) algorithms allowing the detailed capture and representation of (stochastic) dynamic elements, such as trees blowing in the wind or water splashing in a fountain. WP4 will be focused on developing editing tools for IBR and VBR scenes and objects and allowing them to be displayed within a videogame development environment. Activities here will involve game developers and experts in HCI. WP5 will perform evaluation of technologies and tools created in previous WPs in collaboration with game developers. WP6 is about dissemination and exploitation activities and will play an important role in CR-PLAY, being the project strictly related with industry and SMEs. WP7 is related with the overall management of the project in terms of meeting its collective and contractual goals.